For two years now, we've felt Ryan Zimmerman deserved the Gold Glove for defensive excellence at 3rd Base. Today, his peers of Managers and Coaches finally saw that light too and fittingly awarded Our Number 11 the trophy for real. Zimmy, the 2009 Rawlings Gold Glove recipient for 3rd Base in The National League. And no fielder dives to his right, or to his left, and snares baseball after baseball with such grace--and still makes the out. The best range, the best reflexes and the finest fielding third sacker to come up to The Big Leagues in some time. You would have to be blind to miss his quality efforts on display throughout the past few years. 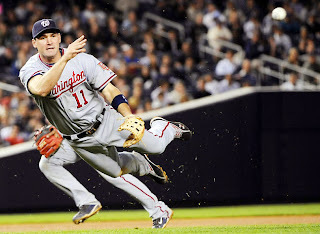 Way more times than not--Ryan Zimmerman delivers on the tough play--making it look easy. The one's that happen so fast, only a video replay reveals his excellence. Anyone watching can "ooh!" & "aah!" over the spectacular plays Our Number 11 makes frequently, but his consistency with that glove makes him special. No other player in the game at 3rd Base makes those great plays so regularly. Game after game. Night after night, The Z-Man is a wonder to watch in the field. His hitting skill and clutch prowess at the plate is not too shabby either. At 25 years of age, Ryan Zimmerman is rounding himself into a complete player. The Franchise Player envisioned since the very moment he was drafted with the 5th pick of the 2005 Entry Draft out of The University Of Virginia. We are proud of you too. Have you talked to any of your teammates about it? (The African Queen). With those final remarks, Sohna and I thanked Ryan for kindly returning our call and letting us know how proud he and his family is today--seeing hard work rewarded. Has a nice ring to it. Doesn't it? We need to start winning, so the entire country can see what an amazing player (and person!) we have in Ryan Zimmerman. We are lucky to have him in Washington, and it is evident from his comments how much he wants people to know about baseball in Washington--even for his award to reflect well on our home city. If the Lerners put the right building blocks around him and our new skipper Jim Riggleman, we can WIN and everyone will see what a superstar Zimmerman truly is. Zim was arguably the best defensive player in the league this year. Considering his offense, he should be in the top 3 in MVP balloting. Riggleman gets some credit for this. Zim's errors went down after Riggleman's ascension. I was thrilled when I heard the news yesterday afternoon! I'm also very proud of Z-Man, and hope it's the first of many awards for him. Thanks for the interview. He always seems to know just the right thing to say and represents our team very well, IMO. Thanks for this interview. I posted the link to Ryan's wall on Facebook this morning. And who had the best seat in the stadium to see Zim day in and day out? The AQ of course!